A lone U-Bicycle (with a helmet) parked on a downtown Victoria rooftop under a blue sky. They’ve been parked everywhere: rooftops, the ocean floor, and when things go according to plan, virtual parking zones. The problem is things aren’t going according to plan for U-Bicycle. In less than two years, nearly half of the company’s downtown Victoria bike rental fleet has been wiped out. Since 2017, 900 rental bikes have been launched on Vancouver Island with 200 of them operating in downtown Victoria. Today only 110 bikes remain downtown. Many of the 90 bikes no longer operating have been vanadilized. In some cases the lock mechanism, which taps into the GPS, is broken off destroying the GPS capabilities altogether. In other cases handlebars are bent, helmets are missing, and seats are swiped. Cacchione says she doesn’t know who is responsible and says the vandalism isn’t specific to one area. “I’m not entirely sure, I don’t have names, and I don’t chose to place assumptions on individuals so I’m not entirely sure. We find the bikes everywhere. There is no specific area where we find a massive clump of bikes that are all damaged,” she says. Since launching, the company has attempted to tighten restrictions on where bikes can be parked. Initially the bikes could be left anywhere, but now there are 135 virtual drop zones where customers are asked to leave their bikes once their booking is complete. The company operates in Victoria, Saanich, Esquimalt, Langford, and Cowichan Bay. Several photos have surfaced of bikes being left outside of the virtual parking zones. 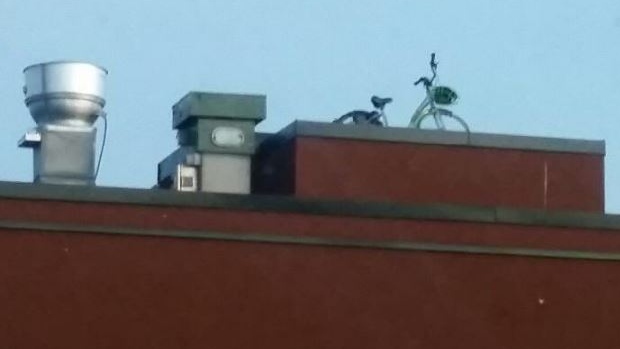 Bikes have been spotted on downtown rooftops. In December a bike was spotted in the Inner Harbour, submerged under the new Johnson Street Bridge. Haha - true. It’s not a drop zone. Can you tell us the location and we’ll send our airlift bike recovery drone. Cacchione says U-Bicycle does recycle many of the bikes. Some of them are sent to Uganda where they are given to children to use in schools. “We want to empower citizens with sustainable efficient and affordable modes of transportation, and that’s what we’re here to do,” she says. Since launching in 2017 the company has generated about 20,000 active users. 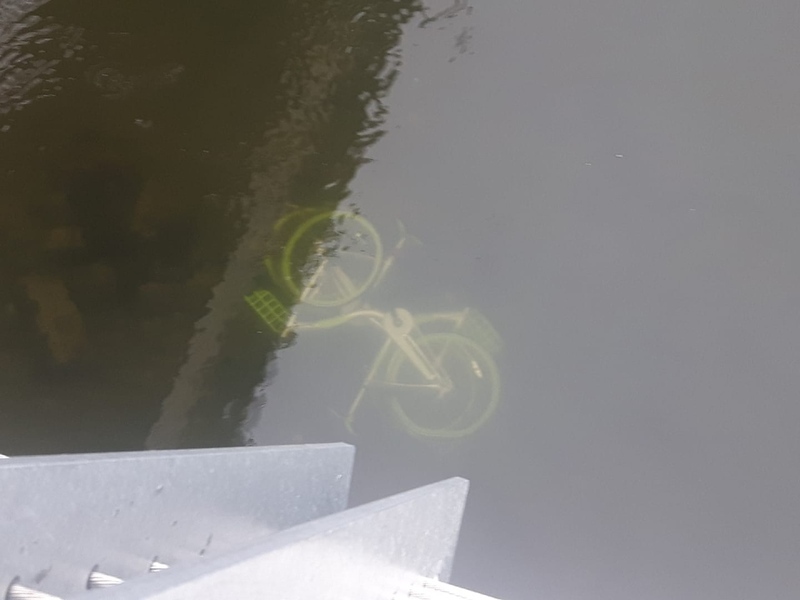 Callisto Rivers shares photo of a U-Bicycle in Victoria’s Inner Harbour, December 16, 2018.